ELRC was formed in 1983 by enthusiasts with an interest in all things Land Rover, and became a Limited Company in 1987. The aims of the club are to promote events for Land Rovers, to encourage the use of these vehicles and their equipment for both competitive, practical and leisure purposes. a ‘Registered Motor Club’ with the Motor Sports Association, so are ‘permitted’ to host competitive events. affiliated to the Parish Paths Partnership for the maintenance and upkeep of rights of way around the county. The club was formed as a family orientated organisation, and we maintain that ethos for all of our events. 33 years ago I went to my first ELRC AGM at Codham Mill (I missed the first one). We used to gather for committee and AGM meetings at Brian and Monica’s Mill house opposite the Mill and then after a cuppa we would cross the road and “very carefully” go up the stairs into the Mill. We sat on school type benches in the cold and dimly lit gloom of a very dusty atmosphere. The benches would periodically drive their feet through the very fragile floorboards. In those days Dave Bygrave would take the minutes in long hand word for word. At about 10.00 pm we would return to the Mill House to thaw out. Monica and Audrey would produce the most amazing sandwiches, pastries and cakes. Then, after half an hour, we would return to the Mill where the meeting would continue sometimes into the small hours. Former: Chairman, Competition Secretary, Membership Secretary, Rover Rescue Coordinator, Exploits Editor, Equipment Officer, Club shop. Currently: A very proud President. Ray joined ELRC at the end of 2007 and joined the committee as Rights of Way Officer in 2010. He also became Chairman in 2017 and now fulfils both roles. Outside the club he is Vice Chair of the Essex Local Access Forum and works with Essex County Council to improve and maintain the byway network in Essex. Ray also enters club trials when time permits and has just signed up for Essex 4x4 Response. I joined the club at Easter 18 years ago. Back then we just had a Discovery. I enjoyed Tyro’s and very soon we were collecting more Land Rovers. Ralph bought me a Series 2 that I instantly named Truckle, and then I was RTVing. After Truckle I had Feegle a truck cab 200TDi defender which gave me power steering, a revelation! We have had some great laning holidays, particularly in Wales, when Ralph drove his LR and I drove my Discovery across the mountains. Now I am a willing passenger for RTV's and CCV's and enjoy being out and about in Ralph's 90. Nigel had his first Land Rover in 1984 and has owned 11 vehicles over the years, 1 x Series IIA, 1 x Series III, 5 x Discovery and 4 x Defenders. He joined the club about 16 years ago during a Discovery period. Nigel was shows co-ordinator for few years and then took over the Rover Rescue controller role from Kevin Hutchings. The Charity support role fitted in nicely with Rover Rescue activities so he manages that as well. I joined the club in 2016, after desperately wanting to find someone to go green laning with. I had no idea this would eventually lead to me being the Laning Officer 2 years later! 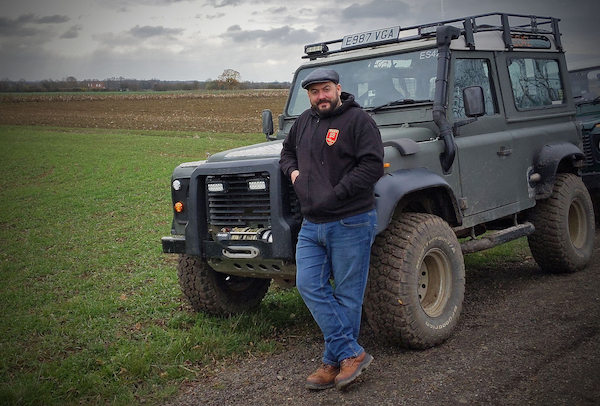 I’m also a member of Essex 4x4 Response, and do my best to support the club at the various shows and events, including helping out at the charity events that 4x4 Response get involved in. My landy is a 1987 Land Rover 90 – I’m owner number 14, and the first to give her some love for some time it would seem – I gave her a nice new 300tdi under the hood, added a whole host of bits and bobs, and I’m slowly swapping out just about everything else that needs it, when time and money permits. We call her Betty, or sometimes just “The Noise Machine” thanks to her straight-through side-exit exhaust, that helpfully warns everyone that I’m coming from several miles away. I have been with the club for several years and am currently the club Secretary as well as the Social Media Officer. Although only owning a Land Rover (namely a Freelander 2) for just over a year, I have been involved in various areas of the club over the years including marshalling, shows, charity event support and also part of the 4x4 Response team. I currently also act as the MSA Child Safeguarding Officer for the club; one of my official roles for the Motorsport Association alongside being a Rescue Crew member which sees me providing safety and medical cover at stage rallies, sprints and cross country events. I joined ELRC about 2005 after visiting Gratech to buy parts for my 1972 Series 3. It was there that Sue said, why not join and get 10% discount! 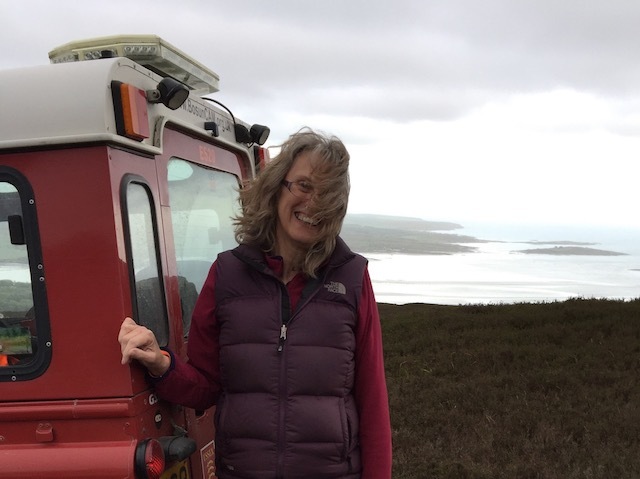 In 2007 I was persuaded by son, Iain, to get a Defender, which I still have for Laning in Essex most months and for annual club holidays including Wales, Norfolk, Coast to Coast, Kent, Hampshire and joined others in Devon. In 2016 Margaret and I drove to the Pyrenees with Uklandroverevents, a fantastic week. Also in 2016 I was persuaded by Ray to take on the role of Treasurer. I joined the Club some 15 years ago along with my wife, Diane and daughter Hannah. Our Land Rover is a 1994 300TDi 90 County Station, which is well known on the Land Rover circuit as I have been involved in many other 4 x 4 activities before and after moving to Chelmsford. I enjoy being part of a well-run, organised Club so I became the Membership Secretary five years ago. I take part in all aspects of the Club which means I get to know a lot of people in my role as Membership Secretary promoting and supporting the Club. Ralph has been on the committee for around 16 years and helps ensure a sense of continuation throughout the club. He is also the Webmaster and is responsible for the design and maintenance of this site. Mark has been on the committee for the last 7 years. His wife Heather helps run events. They bought a 200 tdi 90 in 2002, and following a recommendation from an off road instructor at Tixover, they joined Essex LRC in 2003. They took part in local Green Lane trips and Holidays and the odd show, and then purchased a 1972 Series 3 diesel to drive in Tyro trials events. They entered their first ALRC National Rally in 2006, with a 1955 86” Series 1, culminating in a class win at the ALRC National Rally RTV event in 2014. The Series 1 has been rebuilt, and they now trial in a 1994 300tdi Defender 90. Paul has been in the role of scrutinieer for around 15 years and has a great knowledge of the many types of Land Rovers at trials and events. He joined the club a few years before taking on the role, and can usually be seen checking the vehicles at trials. He drives a distinctive blue Series 3 109" known as "The Oil Tanker", due to it's turning circle. Over the last 3 years he has also worked on a new project, restoring a 1951 Series One rag top. This has been a complete strip down and is now up and running. Known as "The Oil Can" it can be seen at shows and events. I joined the club in early 2008 just before the snowy Easter event at Hallingbury. I am a fairly active member of the club having tried my hand at tyro and losing to teenagers! I am a member of Rover Rescue and enjoy helping out at charity events. I have been shows coordinator for a number of years with a couple of years break. I am also responsible for the club equipment. I have managed to work my way through 6 Discoveries in that time and think I should stop now and look for a nice series to restore.